A sunset over Kluane Lake in the Yukon Territory in Canada is the perfect time to pull your canoe up onto the beach and enjoy the scenery and tranquility of the area. Kluane Lake in Kluane National Park in the Yukon Territory of Canada is a beautiful nature place to enjoy a canoe trip and explore the different shores of the area. There are plenty of spectacular beaches for you to pull up your canoe and enjoy an evening watching the Yukon sunset. 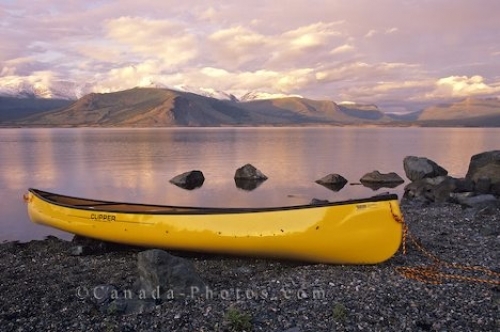 Canoe on the banks of Kluane Lake at Sunset in the Kluane National Park in the Yukon Territory of Canada. Picture of a canoe at sunset on the shores of Kluane Lake in Kluane National Park in the Yukon Territory in Canada.